We are updating our regular events on this website. Please visit our What's On Page for more details. 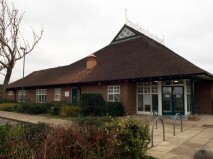 Notley Green Community Centre is sited in the village centre of Great Notley to the south of Braintree. The Community Centre was completed in 1995 and owned by Braintree District Council (BDC). The Notley Green Community Association (NGCA) was formed to manage the Centre on behalf of BDC for the benefits of the local residents in Great Notley and, for historical reasons, Black Notley (the Benefit Area). NGCA was officially constituted on 1 February 1996 and is governed by a definitive Trust Deed and Rules dated 16 February 1996. NGCA is registered with the Charity Commission, Charity number 1058443. See our Annual Reports on the Charity Commission website. The NGCA Community Centre was officially opened by HRH The Princess Royal on 12 November 1996. The purpose of NGCA is to establish, or secure the establishment of a community centre for the benefit of the inhabitants in the Benefit Area, and to promote other charitable purposes as required. The NGCA has continued to expand its membership and activities over the years. Details of the activities are listed in the What's On page of this site. Our On-line Hall hire Request System is now available. Hirer can click here to request on-line, or download a copy of our form by clicking Occasional Hire request form, and return the completed form to NGCA Admin Office. Please also check our Occasional Hire Terms & Conditions. Occasional hirer must attach the initial deposit before a request will be considered.